Black leather tote bag for women is the most versatile bag. It can be fit for anywhere and keep anything. You can use them different ways such as school bag, laptop bag, gym bags, beach bags, overnight bags, shopping bags, work bags, knitting bags, and have many more uses. The word tote means “to carry”. So the tote bags are large sizes and roomy so that they can carry a good number of things. They can have one or several compartments. The tote bags are various design, durable, long lasting, re-usable and fashionable. 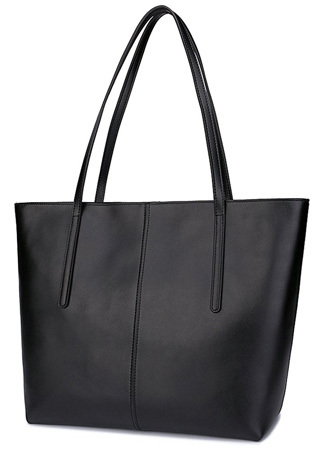 This black leather tote bag has two sizes, big and small. The length, wide and height of the big sizes bag is about 48 cm, 15 cm and 30 cm respectively whereas the length, wide and height of the small sizes bag is about 38 cm, 13 cm and 26 cm respectively. The small bag comes with an additional adjustable and detachable strap. It is well made and the manufacturing leather is high quality. It has lots of room which is perfect for 15 inches laptop. it has 3 interior compartments. Among them the middle compartment is closure with zippered and rest two are opened. Moreover, it has three interior pockets. The whole interior bag are zippered closed so that nothing falls out. The height of strap is about 22 cm which is big enough for the shoulder. 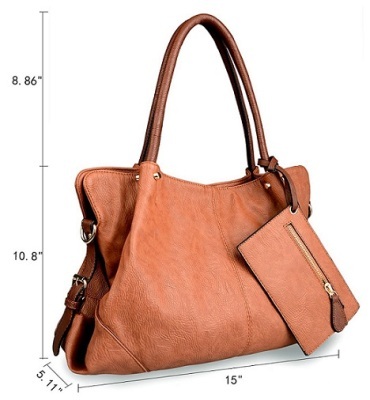 This bag is beautiful, soft, lightweight and the zipper is close smoothly. A versatile tote bag that can be carried in different shapes. Fun and colorful design for everyday use.